Nashville, TN -- Rhonda Vincent, who The Wall Street Journal dubbed "The New Queen of Bluegrass," is giving fans the opportunity to experience the most exciting show in the history of bluegrass music from the convenience of their living rooms, as captured in their new DVD/CD "All The Rage - Volume One." The project features 14 songs, filmed LIVE at Bethel University in McKenzie, Tennessee during a 60-minute concert setting, and will be available on both CD and DVD via Upper Management Music on November 11. For a limited time, anyone who pre-orders the project on rhondavincent.com will receive autographed copies. Organizers are adding a second day to one of the area’s fastest growing outdoor heritage music events. In its fifth year, the Chantilly Farm Bluegrass and BBQ Festival will take place on May 22-23, 2015 at the beautiful Chantilly Farm in Floyd and will feature many of the most popular performers in bluegrass and mountain music, along with a variety of children’s activities, expanded camping, arts and crafts vendors, and other festivities. 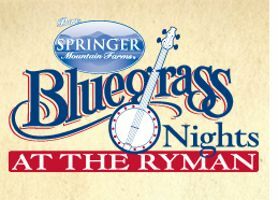 Nashville, TN -- The Society for the Preservation of Bluegrass Music of America's (SPBGMA) reigning Entertainer of the Year, Rhonda Vincent & The Rage have received five nominations for the upcoming SPBGMA convention, set to take place in Nashville, Tennessee, during the weekend of February 5-8. Vincent, who was just named one of the Digital Journal's "5 best female voices in bluegrass music," is no stranger to the SPBGMA awards, as she was inducted into their Hall of Greats in 2014. Folks from all over the Country will be making their way to Virginia Motorsports Park in North Dinwiddie, Virginia on June 4, 5, & 6, 2015 for the Dinwiddie Music Festival. This festival will feature some of the best in Bluegrass and Americana music. Headliner bands like Ricky Skaggs & Kentucky Thunder, Rhonda Vincent & The Rage, Russell Moore & IIIrd Tyme Out, the Lonesome River Band and many more will be here performing during the festival of music.